When John Pierre and Linda Marquez arrived in Coronado in 2000 and established Coronado Yoga & Wellness Center, it was a first for the Crown City. Apparently so… today, 17 years into the new millennium, it seems there’s no end to the island settings where you can get your om on. Yoga classes embellish the Coronado landscape from stem to stern — you’ll find early morning classes on the grass at Centennial Park with a backdrop of the San Diego skyline and dock yoga at Loews Coronado Bay Resort overlooking the marina. There is yoga on the beach at Loews Coronado Bay Resort and the Hotel del Coronado as well as classes in gyms, on private patios, and even on paddle boards. The new John D. Spreckels Community Center will offer yoga classes for seniors, and yoga is one of the most popular offerings at Sharp Coronado Hospital. Some people like their yoga hot. Coronado Hot Yoga, at 1330 Orange Ave., can oblige quite nicely. It features the 26 postures of hatha yoga designed to scientifically warm and stretch muscles, ligaments and tendons in a specific order developed by Bikram Choudhury, the founder of the Yoga College of India. Born in 1946, Choudhury began practicing yoga at the age of four, devoting four to six hours a day to yoga throughout his life. At age 13, he won the National India Yoga Championship. All postures are practiced in an environment of 105 degrees, with the theory that a warm body is more flexible. During the 90-minute class, you can plan on sweating — a lot — and it is therefore recommended that you drink as much water as you can before and during the class, and exercise on an empty stomach. Women usually wear exercise shorts, tank tops and sports bras. Men usually wear exercise shorts or swim trunks with an optional T-shirt. And do bring a towel. Classes are offered daily, beginning as early as 6 a.m. and as late as 6:30 p.m.; check the schedule at nadohotyoga.com. At her Blue Lotus Studio within the Deep Blue Sanctuary Spa (formerly La Petite Comfort), Lulu Martin works with clients in hatha yoga and restorative yoga to facilitate relief from pain or discomfort and to harmonize and balance energy. “Sometimes, I help them recover from an injury or a major illness, such as cancer or a stroke. Yoga helps us refuel our bodies and provides relief from stress or anxiety.” She sometimes ends her classes by sounding her crystal bowls. The sound of the bowls’ vibrations connect to energy centers in the body called chakras. “Most people find them deeply relaxing and harmonizing,” she said. 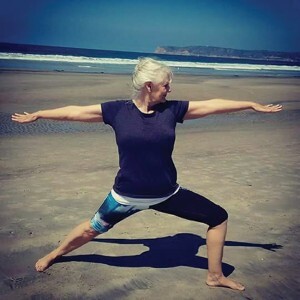 The daughter of a former commanding officer at North Island Naval Air Station, Martin took her first yoga class on the lawn behind the Coronado Library when she was 15. In 1992, she began her teacher training at the Master Yoga Academy in La Jolla. Neither the library lawn nor the yoga academy exist today, but Martin and her clients are in tiptop shape. In 2000, Dee Sloan was diagnosed with fibromyalgia and adding to its painful flare-ups, in 2011, she injured her back. Shortly thereafter she moved from northern California to Coronado. Adult Education at Coronado High School features year-round yoga with most classes offered two nights a week. Classes include “Everyday Yoga” (recommended for beginners); “All Levels Yoga Flow,” “Gentle Somatic Yoga” (focused on reversing the effects of pain and a good choice for individuals with limited mobility and muscular stiffness) and “PiYo Live,” a faster-paced combination of yoga moves and pilates; all are priced at about $7 each; the most affordable option on the island. It would not be overstating things to say that the Marqueses birthed much of the yoga tradition in Coronado. Their studio is recognized by Yoga Alliance as a school that can certify yoga teachers, but their credentials go far beyond that. While studios might earn the certification after five years or so, Jean Pierre has taught yoga for 50 years; Linda for 35, beginning with his Institute of Mind and Body Awareness in Los Angeles. Many Coronado teachers -— and yoga teachers throughout the San Diego region and beyond — were once students of one or both Marqueses. Dwaileebe recently opened her own studio, transforming the courtyard patio at Discover Wellness (543 Orange Ave.) into a peaceful Zen-like center where she teaches a variety of yoga classes, including restorative yoga. “People call it their sleepy-time yoga. I provide blankets and do readings. “ Also popular is “Vinyasa to Vino,” where the yoga class ends with a glass (or two) of wine. “Yoga is for everybody,” Dwaileebe emphasized. “People will say, ‘I can’t do yoga — I’m not flexible.’ But I tell them yoga gives you flexibility! “Imagine a peaceful setting, like walking on the beach,” he instructed. “Keep that image in your mind while you are breathing fast, huffing and puffing. You just can’t do it. 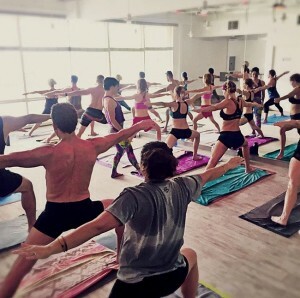 Some like it hot: It’s 105 degrees inside the studio at Coronado Hot Yoga; the better to warm up those tendons and ligaments in accordance to the principals and teachings of yoga guru Bikram Choudhury. 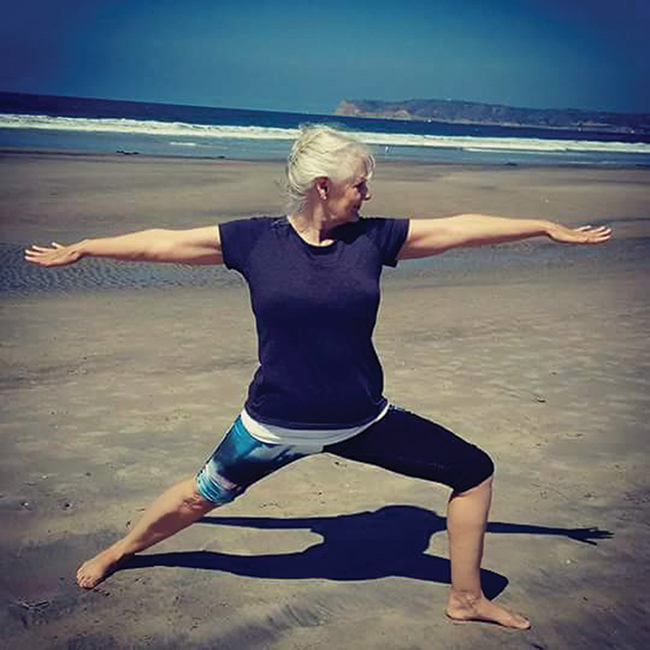 Dee Sloan, who teaches gentle somatic yoga at Adult Ed at Coronado High School, demonstrates the classic Warrior pose. 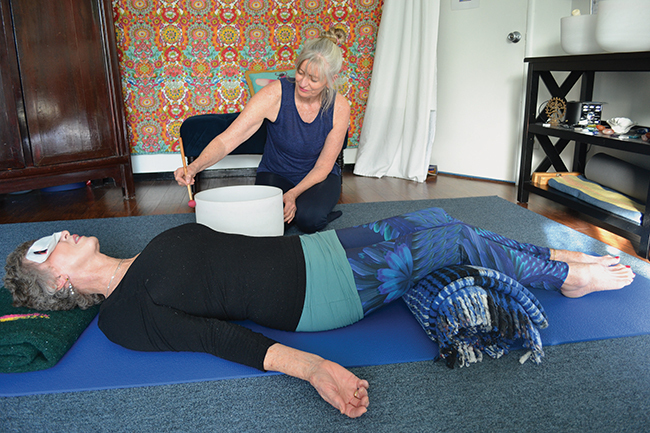 Lulu Martin enhances her private yoga session with longtime client and friend Caroline Murray through the use of crystal bowls, providing a resonance that connects with the body’s chakras. Dock yoga at Loews Coronado Bay Resort is designed to relax with a flow of movements, breathing exercises and light meditation. Sessions are offered at 8 a.m. every Tuesday and Thursday; complimentary for hotel guests, $10 for visitors. 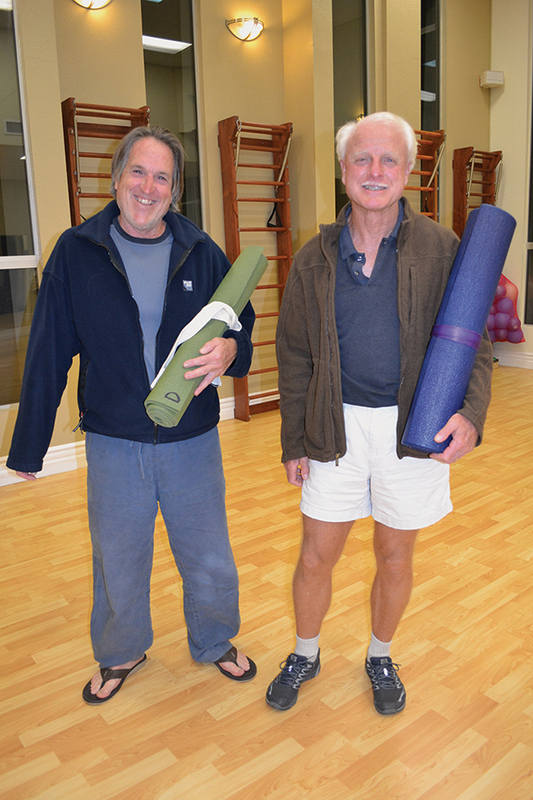 Murray Nies (left) turned to yoga to develop more agility. “But I’ve grown to love the meditation aspect of it, too,” he said, while Sandy Knapp (right) began practicing yoga about nine years ago to stay limber. “It virtually eliminated my back problems,” he said. 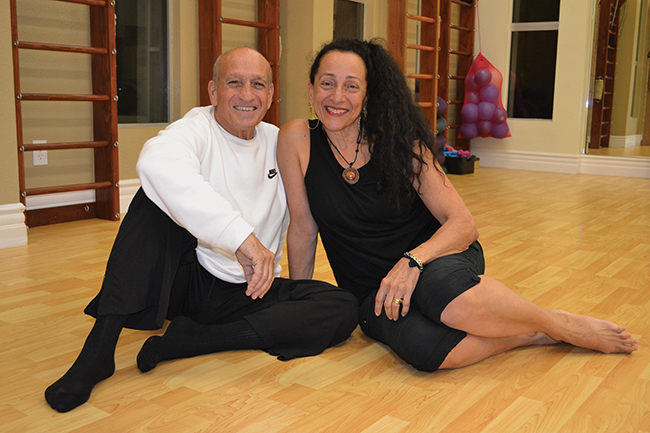 Jean Pierre and Linda Marques opened Coronado’s first yoga studio in 2000. “Just like church, you take the teachings of yoga home with you. It’s about love,“ said Jean Pierre. “And compassion, patience, and taking better care of yourself,” added Linda. 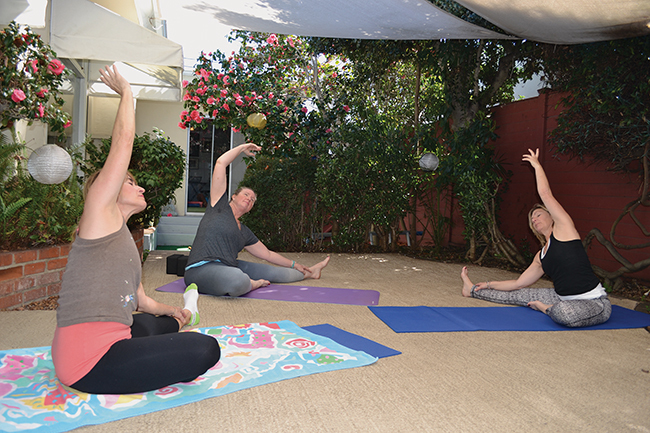 Danell Dwaileebe, right, leads a yoga stretch session in the courtyard patio at Discover Wellness, which is her studio.